DIANA DIES WHEN SOLLOG WARNED IN US COURT CASE! The WARNING Diana would die on the 31st. It had the FACT that Diana would die on the 31st in France in it! 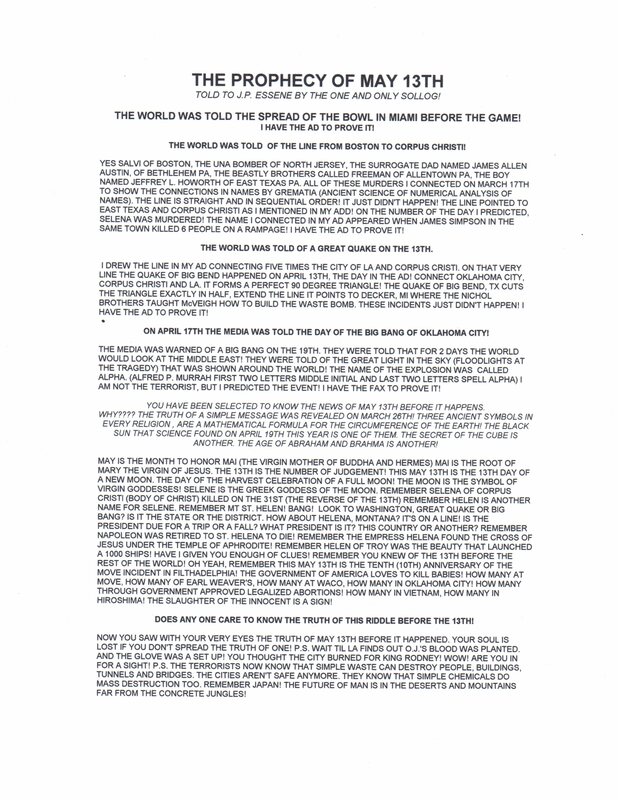 The document in his book is titled the May 13th Prophecy. It's been a Federal record, since February of 1996 in his case. We've posted the Federal document warning of (DIANA) the Goddess of the Moon's death on the 31st. It has been a federal record since February of 1996. The case is 96CV 1499. It also mentioned France as the location! The name, date and location were given in this amazing Federal record. We have a $100,000.00 GUARANTEE it is authentic! Who is the man called Nostradamus of the 90's by some in the media, who can GUARNTEE when celebrities die? He even gave the date of Rabin's death to a federal judge in Philadelphia, ONE MONTH before the hit! The US government arrested him in 1995 for writing in his church'ss newletter thta Bill Clinton will die on a day with 113 in it. We've posted the transcript from his arraignment with a $100,000.00 GUARANTEE it is real! As much as you may want to not believe this is a real account of events in Philadelphia. It is real. I wouldn't joke about such a thing and soil the name of Princess Diana with a falsehood. The case with these documents is in the USS Federal court system. It's docket number is 96CV 1499. Yes, as bizarre as it may sound, GOD sued the US of A in February of 1996 for false arrest and demanded the USA to terminate all Nuclear Devices or be destroyed! He recorded some documents in which he GUARANTEED FUTURE WORLD EVENTS to show he is who he say he is! World events have now been happening that he GUARANTEED in 1995, such as DIANA's death on the 31st in France! The same document warned of a trip or fall involving the President of the US. It happened this year also. It named Helena Montana and mentioned the UNABOMBER. Almost ONE YEAR after Sollog penned this WARNING about the FUTURE and NUKES, the UNABOMBER ws indeed arested and held in Helena Montana! His is known on the internet as Sollog. But, his followers call him LORD GOD ALMIGHTY. I see his email from all over the world. It's either address GOD or Lord GOD Almighty! He also says everyone else is GOD through the HOLY SPIRIT of GOD! He ownes this name on the internet. Federal Judges have called him GOD ALMIGHTY when he and his followers showed up in court to sue the US for false arrest. When was the last time you heard that a Federal judge actually called any GOD in their court room? It happened! I was there reporting on the event. Run a name search on God in the Philadelphia Daily News search engine. They have a record of one of his cases, the headline of the article is He says his is GOD! He says he came to unite the world's religions. He revealed a simple formula for the Earth's perfect measurement in 1995. It involves the CUBE and age of Abraham. It unites every relgion to ONE ORIGIN! Click on the CREATOR FORMULA below to see this remarkable mathematical proof of how the Earth was intelligently designed around these two symbols, the dimesnions of the CUBE and 100 years or the age of Abraham when Sarah gave birth to Issac the father of Israel. In 1995, Sollog or GOD was arrested by the US government for writing in his Church's Newsletter that Bill Clinton will die on a day with 113 in it. That document also warned of TWA 800, Valujet 592 and Clinton's leg injury. Yes, the document he was arrested for writing in 1995, gave the location and details of TWA 800 and Valujet in a federal record in 1995! It specifically WARNED the President not to golf near MIAMI! Two years later the Presidnet suffered a terrible leg injury golfing near Miama! We have a $10,000.00 GUARANTEE that this document is a real US Federal record filed in February of 1996! It specifically warned the President to not vacation in Jackson Hole again, or a plane tragedy would occur. One year later NINE died in a Presidential support plane crash in Jackson Hole, exactly where Sollog warned in the letter he was arrested for writing! In early 1996, he sued the US government for his false arrest in 1995. The US Federal goverrnment dropped the case after he GUARANTEED to a federal judge that a world leader would die on the day that Rabin then died! We have the amazing transcript of his arraignment in Philadelphia from October 4th 1995. Rabin died on the day he WARNED the Federal judge ONE MONTH later! In his US Federal case 96CV 1499, Sollog put his ninth book into the Federal court records. It's called ONE THE TRUTH! He specifically stated in his lawsuit, that this book about the FUTURE will save many, many lives from the horrible death of Nuclear Terrorism! He GUARANTEED that future world events would happen as his book specifically WARNED! Within his ninth book, titled ONE THE TRUTH, is a GUARANTEE called the May 13th Prophecy. This amazing Prophecy WARNED that Bill Clinton would trip and fall and injure himself! This same Prophecy also warned DIANA (Goddess of the Moon) would die on the 31st, as Selena of Corpus Christi had died also on the 31st! It explained how Selena was connected to Selene the Greek Goddess of the Moon! DIANA is the Roman Goddess of the Moon! They both died on the 31st, the EXACT day his Prohecy WARNED! IT even warned FRANCE would be connected to the event! His book, which is a US Federal document, explained how he predicted Selena would die in an article that he published in Philadelphia in a major News Weekly from March of 1995. HE said his book is a warning to MANKIND about the horrible FUTURE of NUKES. He said many are saved from this terrible death, by him putting the future into this US Federal record! Those that have the public released edition of this book, called ONE THE TRUTH! second edition, this prophecy is on page 173. In this May 13th Prophecy, Sollog said to REMEMBER (Diana) GODDESS of the MOON and her death on the 31st (the reverse of the 13! It now happened. Right next to this WARNING about DIANA, is the WARNING to Bill Clinton. It said The President is due for a TRIP or a FALL, is it this countrie's President (the US)! It then warned FRANCE or Napleon would be connected to the tragedy! Sollog also uses Kabbalah in his mystical writings. Ask a Jewish Rabbi what Kabbalah is. It's a mathematical science of using alphabet chracters to hide numerical meanings. Many Rabbi's study Kabbalah in their faith. Sollog put the number 1000 next to his DIANA warning. It has the numerical value of 831 in Kabbalah, DIANA died on that EXACT date 8/31! Look in GODWINS Cabalistic Dictionary. The Hebrew word for 1,000 is Elep. See page 603 to verify what I'm saying, as to it meaning 831! This document is posted on Sollog's Site. We have a link to it below! It's real or I wouldn't be writing this article about it. We recommend you buy this second edition book. It's sold on Sollog's site. All proceeds from Sollog's writings go to feed the homeless. Sollog also donates the earnings from his numerous Software companies to the same charity that feeds the homeless from his book earnings! Remember, Sollog says this book was written to save the many lives of the people that live in the large cities that he says are about to be destroyed by the stupidity of mankind and Nuclear Terrorism! What have you done to save anyone? What have you done to feed the homeless? This isn't a hoax. The US Federal case is real, it's 96CV 1499 in Philadelphia's US Federal court system! Sollog's book about the FUTURE, ONE THE TRUTH! is there also! We GUARANTEE it is with a $100,000.00 GUARANTEE!